The San Francisco Giants were declared the National League team to beat in this space during the offseason, even after the Phillies reacquired Cliff Lee. Nearly two-thirds of the way through the season, there is no reason to believe otherwise. Sure, the Phillies have a better record, but the pitching is a push, and the addition of Carlos Beltran from the New York Mets gave San Francisco the sort of offensive shove that raises the confidence of a contending team. A baseball source said that Phillies president David Montgomery would never have allowed general manager Ruben Amaro Jr. to trade away a top prospect for a rental player like the Giants did when they parted with minor-league pitcher Zach Wheeler to get Beltran from the Mets Tuesday. Such a decision will immediately be viewed as dumb by some and wise by others. What Amaro is able to accomplish before Sunday's 4 p.m. deadline will ultimately sway public opinion. While the Phillies have no interest in mortgaging the future for a rental property like Beltran, they are more than willing to pay a high price for someone such as Houston's Hunter Pence, because he would call Philadelphia home through at least the 2013 season. That window coincides nicely with how much longer the Phillies hope to still have Lee, Roy Halladay, and Cole Hamels in their starting rotation. Regardless of what Amaro can accomplish before the deadline, it will not change the fact that the Giants again match up nicely against the Phillies, should the teams meet again in the postseason. They matched up well last season, and the addition of Beltran makes the Giants even more threatening against the Phillies should the teams meet again. Consider this: The three pitchers Beltran has faced the most on the Phillies staff are Halladay, Hamels, and Ryan Madson, and he is batting a combined .333 (33 for 99) with nine home runs and 21 RBIs against them. Beltran is only 1 for 8 against Lee, but it's important to remember the Giants were less than intimidated by the lefthander when they beat him twice in last year's World Series. By contrast, the Phillies batted .216 against the Giants in last year's NLCS, and, based on the final two games of this regular-season series, it does not appear as if they are any better-equipped to handle Matt Cain and Tim Lincecum. Those are the two starting pitchers the Phillies almost certainly would see twice each in a seven-game series with the Giants, and that should be a scary thought for the Phillies and their fans, regardless of what offensive addition they may make. In the final two games of this series, the Phillies batted a combined .156 (7 for 55) against Cain and Lincecum and got only two hits in five innings against the San Francisco bullpen. "They're good pitchers," Phillies manager Charlie Manuel said. "You say they are great pitchers. I don't know how great they are. I think as they move into their career and have longevity, that's what greatness comes by. I saw good pitching, but we can beat that. I've seen us beat that." As much as Manuel wants a righthanded bat, what he'd need most in a postseason series against San Francisco is for his lefthanded bats to produce against Cain, Lincecum, and closer Brian Wilson. 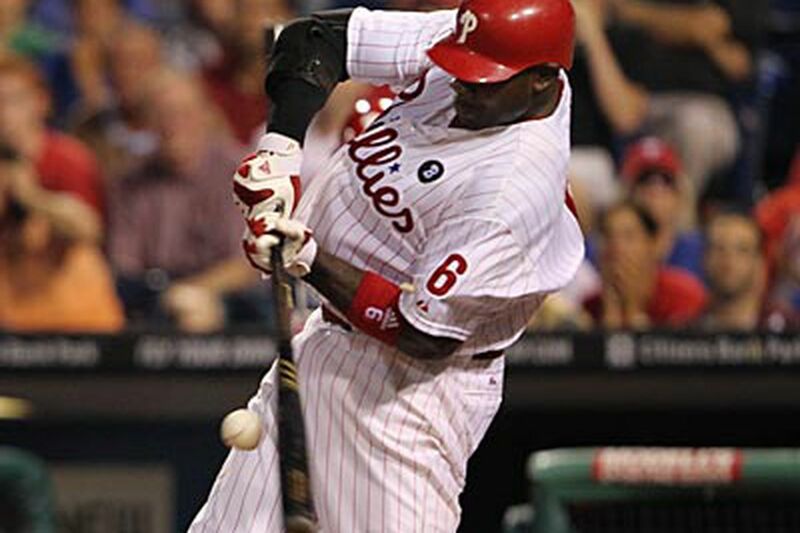 It will not matter whom the Phillies acquire at the deadline if Chase Utley, Ryan Howard, and Raul Ibanez cannot figure out a way to have more impact against the Giants. That trio was a combined 15 for 63 with one RBI in the NLCS last year and 1 for 18 against Cain and Lincecum in this series. "We can work the count better and get better balls to hit, and things can go our way at times," Manuel said. Utley came up three times against Lincecum with runners in scoring position Thursday night and could not produce. He eventually delivered an RBI double off lefthanded reliever Jeremy Affeldt in the seventh. Howard, meanwhile, struck out in the first and left runners on second and third in the seventh against Affeldt. Pence may not be the answer if the Phillies do run into the Giants in the postseason. He is a combined 6 for 34 against Cain and Lincecum with one home run and three RBIs. That should not come as a surprise because Cain and Lincecum are terrific pitchers who shut down most teams they face. Ryan Ludwick, another potential addition, is 3 for 23 against Lincecum and 6 for 16 with two homers off Cain. The point here is that the Giants remain the team the Phillies should least want to face in the postseason. That's not to say they cannot beat them. It will just be one of those series that could go either way.